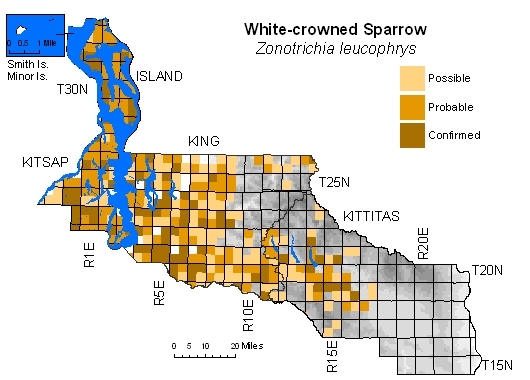 Common and widespread throughout western lowlands in open, scrubby habitats, including cities. Penetrates to higher King County elevations along major river corridors and crosses Cascade crest, frequenting clearcuts, wetland edge, woodlots, farmsteads, and towns down to ponderosa pine zone. Invasion of Kittitas County rapid and of recent date, with Washington's first documented breeding east of crest near Elk Heights in 1988 (Smith et al. 1997). 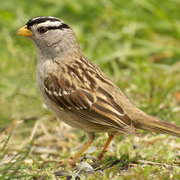 Two subspecies breed in area: Z.l. pugetensis widespread, Z.l. gambelii only at high elevation near Naches Pass (although common migrant). Absent from high, rugged mountains north of Snoqualmie Pass on both sides of crest.